Sarcophagus of the Good Shepherd, marble, bas relief, Praetexta Catacomb, Rome, c. 390 AD. Larger picture. In this chapter we'll examine the LORD our Provider (Yahewh-jireh), explore the metaphors of God which demonstrate his willingness to help, assist, and provide for his people. One of the best known of these is the Lord Our Shepherd (Yahweh-rohi, Psalm 23), who leads us and supplies our needs. In addition we'll explore the God Who Sees (´El-roi) and the LORD is our Healer (Yawheh-rapha). 'Here I am,' he replied. Abraham is in Beersheba in the Negev desert to the south of Palestine. Mt. Moriah may refer to the temple site in Jerusalem (2 Chronicles 3:1). 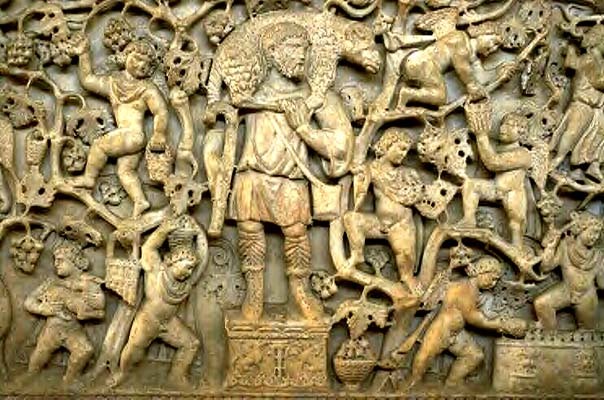 Child sacrifice was practiced during some periods by the Canaanites and Phoenicians, and Abraham didn't know that the God who had revealed himself to him didn't require child sacrifice. So he obeyed -- immediately -- a pretty clear indicator of Abraham's faith in and devotion to God, and to the clarity of God's words to him. Now the boy begins to realize that something is missing -- the sacrifice. 'Yes, my son?' Abraham replied. Here I am,' he replied. Abraham's faith and commitment are clear. Of course, God knew how Abraham would respond, but this was a test of faith, much like tests we sometimes face. And God sees us through our tests, too. "Abraham's Offering" by Jan Lievens (Dutch painter, 1607-1674), Herzog Anton-Ulrich Museum, Germany. From that day forward, Abraham remembered the name he had given that mountain top -- Jehovah-jireh, Yahweh-yir´eh, "The LORD Will Provide." Q1. (Genesis 22:1-14) Do you think Abraham was really expecting God to provide a sacrifice, or that was just what he told Isaac? What support do you have for your position? Did you ever receive a last-minute provision from God? In what circumstances can we expect God to supply our needs? Any conditions? Abraham's experience of the Lord Who Provides on Mt. Moriah was just the beginning. In a number of ways, God revealed himself to Israel as their Provider. The Israelites were sheep and cattle herders from their very beginnings with Abraham, who possessed vast herds, so many sheep that he and Lot had to separate in order to have enough pastureland for both (Genesis 13:6). When they settled in the promised land after the exodus, most Israelites became subsistence farmers, growing their own food. But most families would have a few cattle and sheep, and some, like David's father Jesse, had larger herds that required the services of a shepherd. Lead the sheep to watering holes and fresh green pasture when they had eaten off the grass in one place. Shepherds today use sheepdogs to drive the herd, but in Biblical days the shepherd would lead the flock personally. One day when I was driving north along the Jordan River to Galilee I saw a Palestinian shepherd leading a flock of 30 to 40 sheep along a path on a hillside. Shepherds had a personal relationship with the sheep, naming them, talking to them, calling them. As Jesus explained in a parable: "... The sheep listen to his voice. He calls his own sheep by name and leads them out" (John 10:5). Heal the sheep when they were injured. Shepherds would bind up their wounds and help them during birthing, as they do today. Rescue the lost sheep. If a sheep wandered off, it was the job of the shepherd to look for it until he found it. Jesus' Parable of the Lost Sheep made the point that a good shepherd wasn't satisfied with just the needs of the larger group, but also sought out the wandering sheep and rejoiced when he had found it (Luke 15:3-7). 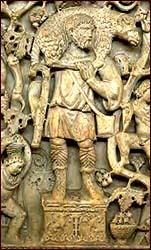 The analogy of the shepherd was not only used to describe God, but also secular and religious leaders. (Of course, the word "pastor" in English and in Spanish means "shepherd.") Prophets Jeremiah and Ezekiel were sharply critical of the leaders of Israel in his day who neglected their responsibility to care for the people (Jeremiah 23:1-4; 50:6; Ezekiel 34:1-10). In one passage Yahweh is called "the true pasture" (Jeremiah 50:7). "Pasture" (NIV, NRSV) is nāweh, which means "pasture, abode of a shepherd, habitation ... where the herd lies down, a place of safety and protection. "4 "True" is tsedeq, "justice, righteousness"5 or "rightness, what is right. "6 Israel had strayed like lost sheep and had forgotten their own resting place,7 Yahweh, their true pasture. "1The LORD is my shepherd, I shall not be in want. The Shepherd is a servant leader, leading to help the sheep find rest, pasture, and water to meet their physical needs. "Leads" is nāhal, "lead with care, guide to a watering-place or station, and cause to rest there, lead, guide, refresh. "9 Shepherd leadership was Jesus' leadership model. Secular leaders often lead for their own gain and benefit, Jesus said, but Christian leaders must be servants, slaves of those they lead (Mark 10:42-44). Jesus said: "For even the Son of Man did not come to be served, but to serve, and to give his life as a ransom for many" (Mark 10:45). "He restores my soul" (Psalm 23:3a). "Restore" is shûb, which here means figuratively, "refresh, restore," literally, "repair. "10 For a sheep, this might include rescue from danger and then getting the animal back into good health through rest and recuperation. For a person, it might include rescue from a messed up life, and the gradual restoration to wholeness through loving care. God is in the restoration and wholeness business. He wants you to be refreshed as you rest in him. "He guides me in paths of righteousness for his name's sake" (Psalm 23:3b). "Guide" (NIV) and "lead" (KJV, NRSV) here is nāchā, "lead, guide," with the idea of conducting of one along the right path.11 Notice the reason that he leads us in these particular paths -- "for his name's sake," that is, because the Lord's reputation and character require that he lead in righteous ways. We are tempted get off the trail by taking moral short-cuts, but our Shepherd leads us in paths of righteousness. The shepherd will sometimes need to lead the flock through uncomfortable places to get them to the next pasture. John Muir, founder of the Sierra Club and father of the American national park movement, was a shepherd when he was young. Early in the summer he would be given a flock and take it higher and higher into the Sierra to bring it to fresh, green pasture. Sometimes the trail between pasture in Yosemite Valley and Toulumne Meadows might be terrifying to the sheep. They wouldn't know where he was going. If they had been people they would have second-guessed their shepherd: "Do you know where in the world you are going?" they might ask -- as we sometimes ask of God. What encourages and comforts the sheep in the fearful darkness of this mountain canyon is the sight of the shepherd's rod and staff. They are the elements of protection that will ward off the wolf. The sheep see the rod and they know that the shepherd will use it to protect them, even to the extent of putting his life at risk -- and they are comforted. Your Shepherd is committed to delivering you from your enemies and has indeed laid down his life for you in the battle for your soul. Q2. (Psalm 23) Can you remember any times when God has cared for you as a Shepherd -- in times of blessing and in times of trouble? What are you facing right now where you realize your need to rely on God as your Shepherd? The word for "table" (shūlchān) means properly "skin or leather mat" spread on the ground.13 I imagine a sumptuous picnic set by a gracious host. Enemies are hiding in rocks around about, spying on the feast set for the guest by the host. But their malevolence doesn't ruin the party because of the host's loving attention. When guests were welcomed in a Near East home it was polite to provide a basin for them to wash their feet, they would receive a kiss, and the host would pour fragrant olive oil on their hair (Luke 7:44-46). "My cup overflows," is a symbol of abundance. The host doesn't just pour it almost full, but overfull -- it's figurative, of course, not literal. God's love for us and provision for us is not meager or stingy, but liberal and abundant. "Surely goodness and mercy shall follow me," is the psalmist's firm assurance, since Yahweh is his Shepherd and Host. "Follow" is rādap, "be behind, follow after, pursue, persecute. "14 In this context, enemies will not chase after him, but he will be pursued by goodness and mercy. What a positive, hopeful, wonderful promise. The psalmist is not a bitter pessimist, but a faith-filled, in-awe-of-God optimist. One of the hallmarks of Hebrew poetry is parallelism -- synonymous parallelism, antithetic parallelism, and sometimes synthetic parallelism. Sometimes a pair of lines seems to have similarity and progression. While the NRSV sees these two lines as parallel in time, most modern translations see the second line as moving beyond the first. The first line describes the psalmist's experience during his natural life ("all the days of my life"), and the second line ventures into the life beyond -- what Christians call eternal life ("I will dwell in the house of the Lord forever"). "Seeing" is the noun ro´î, "looking, seeing, sight." With ´El, the generic term for God, the phrase means "God of seeing" or "God who sees. "16 It is variously translated as "the God who sees me" (NIV, the Message), "a God who sees" (NASB), and "Thou God seest me" (KJV). The Jerusalem Bible and NRSV don't attempt a translation, but transliterate the Hebrew, "You are El-roi." Wherever we are, whatever trouble we are in -- even through our own mistakes and impulsive actions -- God sees us. 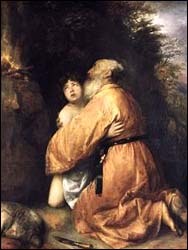 He saw Hagar for Abraham's sake, since she was bearing Abraham's child. He sees us for Jesus' sake, since we are not our own, we have been bought with a price (1 Corinthians 6:19-20). Of course, one of the important functions of a shepherd was to be a physician and healer to the sheep, binding up their wounds and helping them in birthing. There were many sun gods. The Israelites didn't worship sun, rather saw the light and warmth of the sun as a metaphor of God's supply. The Lord supplies strength and joy. "The LORD is my strength and my song (Exodus 15:2; Psalm 118:14, Isaiah 12:2). "Song" is zimrâ, "song, music". Perhaps this is a way of saying, God, you are the music of my life! In a number of passages God is related to a particular place. But in this one case God identifies himself as the God of Bethel, that is the God who revealed himself to Jacob and reassured him at Bethel (which means "House of God," Genesis 31:13; 35:7). Similar expressions are found in Psalm 119:57; 142:5; and Lamentations 3:24. Jeremiah calls him "the Portion of Jacob" (Jeremiah 10:16 = 51:19). The priests and Levites weren't given land as their inheritance. Instead, "I am your share and your inheritance among the Israelites" (Numbers 18:20). And, conversely, his people are the Lord's portion, as well (Deuteronomy 32:9). "Portion of my inheritance" is made up of two words. "Inheritance" is chēleq, "share, part, territory, which we explored above. "Portion" is mānā, means "portion, part," especially "choice portion. "19 Cup (kôs) is a "drinking goblet," sometimes referring to a destiny of judgment. Here and in Psalm 23:5 it is a cup filled with blessing from the Lord.20 The Lord is my Cup of blessing. "The Lord is my helper; I will not be afraid. "But you, O LORD, do not be far away! "Sustainer" is sāmak, "lean upon, lay, put, uphold, support. "24 The NRSV translates the phrase "The Lord is the Upholder of my life." Q3. Why do we sometimes resist calling on God to be our Helper? Why do we try to do it ourselves first? What is required of us if God is to be a Helper and Shepherd to us? Other references are Jeremiah 17:13a and Psalm 71:5. KJV calls Yahweh the "hope (machseh) of his people" (Joel 3:16b), though a better translation is "refuge" (NIV, NRSV). A final metaphor for God our Provider is "Spring of Living Water" (NIV) or "Fountain of Living Water" (KJV, NRSV). It is so like us to try to find a way to get the blessings of God without having to depend on God for them, to some how find formulas for living that bypass dependence. That is how the Israelites sinned. God was an everflowing fountain, but their substitute was a cistern that could become depleted or be broken and leak out. Our substitutes for God are never an improvement, but a sad detour. Ultimately, we must come back to the source. Q4. Meditate on the concept of God as a Spring of Living Water or a Fountain of Living Water for you. What does this say about God? About your thirst? About your future? Gerald Frye, a friend and colleague in pastoral ministry, has developed his own wonderful descriptor for God: "TheLord who is more-than-enough." God is our Provider, our Shepherd, our Healer, Hope, Sun, and Everlasting Light, our Portion, our Helper, the Sustainer of our Soul, our Fountain of Living Water. He longs to be the One you trust to meet your needs. As Paul assured the Philippian church: "My God will supply every need of yours according to his riches in glory in Christ Jesus" (Philippians 4:19). O Lord, you who love us: I know you long to care for us, to let us be the recipients of your generosity and mercy. But we are ever resistant to taking "charity," and insist on doing it ourselves. Please help us to relax in your love and receive from you. And build our faith that we might trust you in the abundant times and in the lean times to meet every need that we have. In Jesus' mighty name, we pray. Amen. If you have a song in this category to suggest, please let me know (www.joyfulheart.com/contact/). I'm including some Shepherd songs, even though some point especially to Jesus as the Shepherd. "A Mighty Fortress Is Our God," words and music, Martin Luther (1529). Verse 1: Our Helper He, amid the flood of mortal ills prevailing...."
"Amazing Grace," words by John Newton (1779), music by James P. Carrell and David S. Clayton (1831). Verse: "... He will my Shield and Portion be, As long as life endures." "Come, Ye Thankful People Come," words by Henry Alford (1844), music by George J. Elvey (1858). "God our Maker doth provide for our wants to be supplied...."
BDB 909, 6g. A similar meaning is apparent at 1 Samuel 16:1 and Esther 2:9. The verb rā´eh, "provide, furnish" in this verse is in the imperfect tense, yir´eh, which could refer to the present or the future. "Shepherd" (NIV, NRSV, NJB) or "which fed" (KJV) is rā`ā, "to pasture, herd" (William White, rā`ā, TWOT #2185). Victor P. Hamilton (Book of Genesis, Chapters 18-50 (New International Commentary on the Old Testament; Eerdmans, 1995), p. 633) translates it literally, "the God who has shepherded me...."
Leonard J. Coppes, nāwā, TWOT #1322a. The New Jerusalem Bible with its "home of justice" follows the KJV rendering "habitation of righteousness," though the context of Israel as lost sheep astray by their shepherds, wandering the mountains and forgetting their own resting place. So John Bright, Jeremiah (Anchor Bible; Doubleday, 1965), p. 340; and C.F. Keil, Jeremiah, Keil & Delitsch, in. loc. Harold G. Stigers, tsādēq, TWOT #1879a. "Resting place" (KJV,) or "fold" (NRSV, Jerusalem Bible) is rēbes, "(place of) lying down, resting" (BDB 918; William White, rēbes, TWOT #2109a.). Jack B. Scott, chāsēr, TWOT #705. Shûb comes from a root meaning of "turn, return," and is often used with reference to repentance (BDB 1000, Po`l stem, 2a. Hiphil, nāchā, TWOT #1341. BDB 635. John E. Hartley, tsālal, TWOT #1921b. William White, rādap, TWOT #2124. Victor B. Hamilton, ´ārak, TWOT #162a. BDB 951. William White, rāpā´, TWOT #2196. Donald J. Wiseman, chālaq, TWOT #669a. BDB 324. John N. Oswalt, kôs, TWOT #965. Charles Schultz, `āzar, TWOT #1598. "Help" is `ezrâ, "help, support, assistance" from `āzar, "help, support" (Charles Schultz, `āzar, TWOT #1598). This is also used in Psalm 27:9 for God. "Help" in this verse is ´ĕyālūt, "strength," from ´ĕyāl, "strength." It is translated "strength" by KJV, NIV, and NJB, "help" by the NRSV. The connotation of help is supported by the Syriac from which this word is probably borrowed, the Ugaritic cognates suggest "strength" (Thomas E. McComiskey, ´ĕyāl, TWOT #79a). R. D. Patterson, sāmak, TWOT #1514. John E. Hartley, qāwā, TWOT #1994e. Leonard J. Coppes, qûr, TWOT #2004a.